Welcome to a side Workshop at WORLD SUSTAINABLE ENERGY DAYS in WELS, Austria on February 28, 2019 at 9.30. 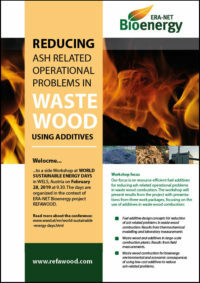 The focus of the workshop is on resource-efficient fuel additives for reducing ash related operational problems in waste wood combustion. Read the full workshop program and invitation here. This entry was posted in Uncategorized on 29 October, 2018 by admin-refawood.